Pula enjoys a comprehensive air network in Europe during summer; and remains connected to a few major European capitals for the rest of the year. With several campsites accepting recreational vehicles, campervans and motorhomes, Pula makes a fantastic base for an unforgettable scenic road trip around Croatia. To get the best deal, compare rates and reserve your Pula motorhome rental online before you travel. Then simply collect the key to your recreational vehicle upon arrival to start your Croatian self drive holiday without delay. Pula is at the southern tip of the Istria peninsula, with history going back 3,000 years; when it was built by Illyrians, a group of Indo-European tribes. The Romans, whose presence is today marked by the towering Arena, occupied Istria in 177 BC. When the Ostrogoths left, Pula became a vital port for the Byzantine fleet. It was during this time that the Basilica of Saint Mary Formosa was built. Eventually, the Venetians, the Habsburgs and Napoleon took their turns until Pula became part of the Kingdom of Italy; which is why this Croatian city speaks Italian as their co-official language; and not just in restaurants when you want to sample seafood delights such as clams with capellini, risotto del mare, tuna tartare, scampi over creamy burrata, and ravioli with various kinds of shellfish. Anywhere you look in Pula, you can see its long and colourful history. The Forum, the main square in the centre of the city, was built on the place of its Roman counterpart. Nearby is the city hall that was constructed in the 10th century. The Temple of Augustus, the Gate of Hercules, and the Triumphal Arch of the Sergii were all built in the 1st century BC; while the Twin Gates were constructed in the following centuries. 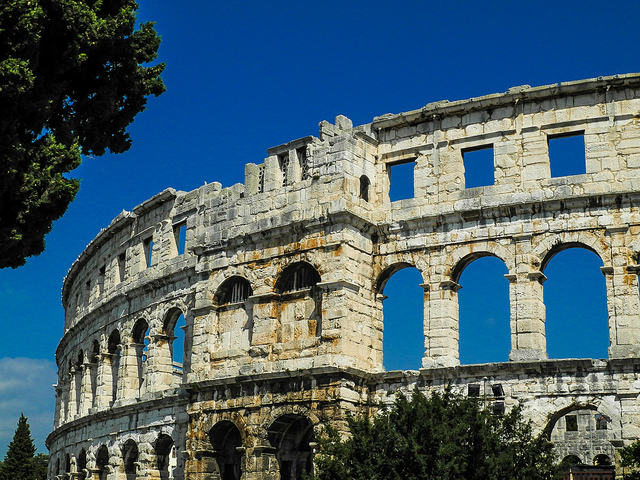 Pula is a small town with a highly walkable historic core. A campsite in Stoja offers camper service for Pula RV rentals; so you can take the short bus ride to the old town and explore its architectural gems on foot. With its turquoise waters and surrounding natural beauty, Pula is an internationally favourite summer vacation destination. About 30 minutes further south by motorhome hire in Pula; the beaches of Cape Kamenjak beckon with crystal blue waters, peebly bays, and natural stone terraces. Swimming, biking and hiking are top activities, along with following the actual fossilized footsteps of dinosaurs that once roamed the Istrian peninsula during the Cretaceous era. Boats can take you to the nearby islands of Brijuni; a Croatian national park renowned for their scenic beauty. Top officials of the former Yugoslavia built vacation houses there. From a camp that offers caravan service for Pula motorhome rental, RV and campervan hires; Fazana is just five kilometres away and lies opposite the Brijuni islands. Board a boat there for more outdoor adventures – golfing, cycling, diving and birdwatching await in the islands. Discover more Croatian islands from the port of Rijeka on the Kvarner Gulf about two hours north by RV hire from Pula. Pula connects to the Dalmatian coast via the Adriatic Highway which starts from the Slovenian border and extends all the way to Montenegro. The A1 Motorway runs parallel to the Adriatic Highway in some places so you’ll have options when driving down the coast to Zadar, Split, and further down to Dubrovnik. If you are dropping off a one way campervan hire in Pula at Zagreb International Airport, drive inland via E65 from Rijeka or A1 from Split. Along the way, spend a night at a camp near Plitvice Lakes National Park to enjoy early access to the 16 interlinked lakes before the crowds arrive.